See Sid Gillman’s name up there? You have to understand that Gillman, to this day, is not well-received by many Miami old-timer alums. *For the record, I asked Roethlisberger during the run-up to Super Bowl XLV if he knew anything about Gillman for the book I was writing, and he admitted that he couldn’t tell me much. Gillman was the first in the long-revered Cradle of Coaches, but there are no monuments to him on campus. His likeness will not be made into a statue inside the stadium. There were people who refused to talk to me when I was researching the Sid book because they did not want to discuss the man who left Miami for good after the 1947 season. For the record, that’s 66 (!) years ago. Sid Gillman made his mark at Miami, but he is also not much more than a blemish on its memories. “You can have him. [Gillman] owed everybody in Oxford when he left,” Lucy Ewbank, Weeb Ewbank’s widow, said as she attended a Miami football statute ceremony in 2010 (at the time, she was 104 years old, and she lived another 15 months). Her opinions are not atypical at Miami. The reasons for that are pretty simple. After four seasons of leading the team to a combined record of 31-6-1 record, Sid left Miami to work as an assistant under Red Blaik at Army, and one year later, he returned to southwest Ohio to take the University of Cincinnati head coaching job. Then, he stole many of Miami’s coaches (including head coach George Blackburn) and many of Miami’s best players to join him in Cincinnati. Miami hired Woody Hayes, who had to rebuild the program that Gillman had raided, and the bitterness remained for many years. Hayes and Gillman eventually fixed their problems, but I can understand Miami’s disgust with Gillman. And that is why it took Gillman until 1991 to make the Miami Hall of Fame. The Gillman family believes Paul Brown was one of the biggest reasons it took so long for the school to induct Gillman (since Brown played and graduated from Miami and since Brown and Gillman were pro football rivals that never reconciled, it’s not a stretch to believe that theory is true). For god’s sake, Gillman was already a member of the College Football Hall of Fame, so yeah, it was a bit of a stretch that Miami hadn’t seen fit to recognize him. One of my most thrilling research discoveries for the Sid book was when, while going through folders at the Miami sports information office, I ran across a stack of letters from 1977 that urged the school’s decision-makers to allow Gillman to enter the Hall. 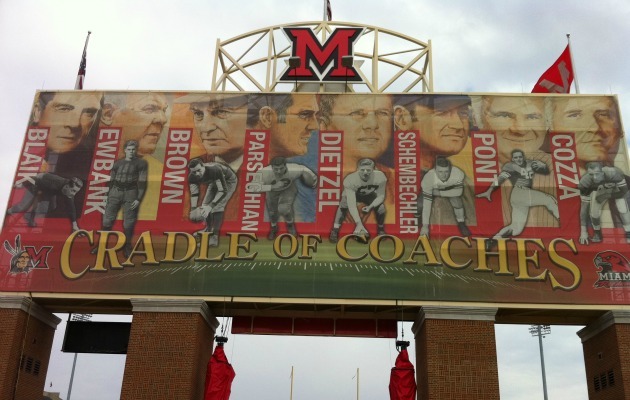 There had been a reunion for the 1947 Sun Bowl team that year, and Gillman’s former players got to talking about the injustice of their coach not being allowed into the Hall (though it could be argued that the honor is reserved for those who graduated from Miami, and Sid, instead, had a diploma from Ohio State). So, his former players decided to write letters – which I read more than 30 years later – to convince the administration that Gillman should be included. The former players penned their thoughts on work stationary ranging from the General Motors Corporation to Century 21 to Stevenson Photo Color Company. There was maybe a dozen of them, and as I fanned them across the desk on which I was working, it was a colorful display that repeated the same thing over and over again: Sid deserves to be in the Miami Hall of Fame. His mark on Miami is obvious for all to see. He needs to be recognized. Do it now. For a guy who I argue falls through the cracks of NFL history, it’s amazing that old grudges kept Gillman out of the place where the people should have known exactly how much he had meant to the program. But that was Sid. An outstanding coach who had made too many enemies. The wart on the index finger pointing the way forward. Despite all the success and because of all the drama, the school punished him for many years – deservedly or not. And it did. Just took another 14 years to make it happen.